Click on the button below each figure to go to that figure's page and see a larger spin and more information ! 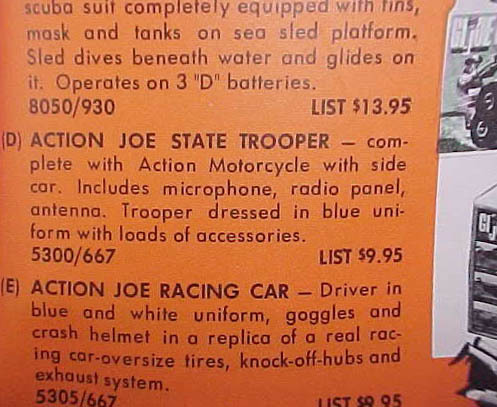 The Action Joe line was released in 1967 and was available through 1968 . It included just two sets. There have been many conjectures about this short run series: that the sets were available in Canada only, that they were Sears exclusives, that they were only available in Sears retail locations, that it was a test marketing run to see how a non-military line would fare. The Canada story does not seem to be accurate; though the sets may have been sold there, my State Trooper came from the original owner whose mom bought it at a Sears store in Texas, and other collectors around the US remember getting the sets as children. The vehicles may have been manufactured at an Irwin plant in Canada. They may well have been made for Sears, as the item number begins with '5' which was the usual code for items marketed or manufactured by someone other than Hasbro. The the Irwin vehicles had numbers in the 5000s, and were sold at Sears and other outlets. 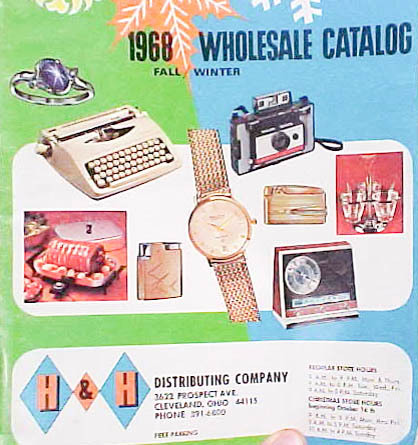 The sets appear in the fall/winter 1968 catalog of a Cleveland, Ohio company called H & H Distributing. See rare images of that below. With many of the original players unfortunately gone, it seems unlikely there will be any definite answers. The bottom line is that more research needs to be done on these fantastic and very rare sets. 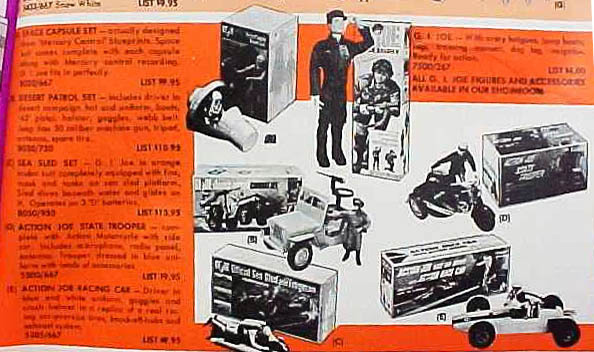 Images from the fall/winter 1968 H & H Distributing catalog showing images of the two Action Joe sets, one of the only documents showing them in the wild. It's also neat to note the prototype box art on the Space Capsule and the prototype long pants on the Desert Patrol Jeep driver. Photos courtesy of top collector and dealer Joezeta. Check out his eBay sales.